In this post, I'll do an in depth explanation on Japanese nail salons, and what to expect if you're going for a manicure in Tokyo! Here's what my final result looks like! Read the rest of the post to see the process! The nail salon I frequent is Nail Salon Vian, which is located in Nishiwaseda, across the street from the Santoku Supermarket. They frequently offer deals on holiday themed designs, which they display on a street sign to lure in customers. Apologies for how textured this photo looks. It had just rained so the sign got wet and wrinkly. 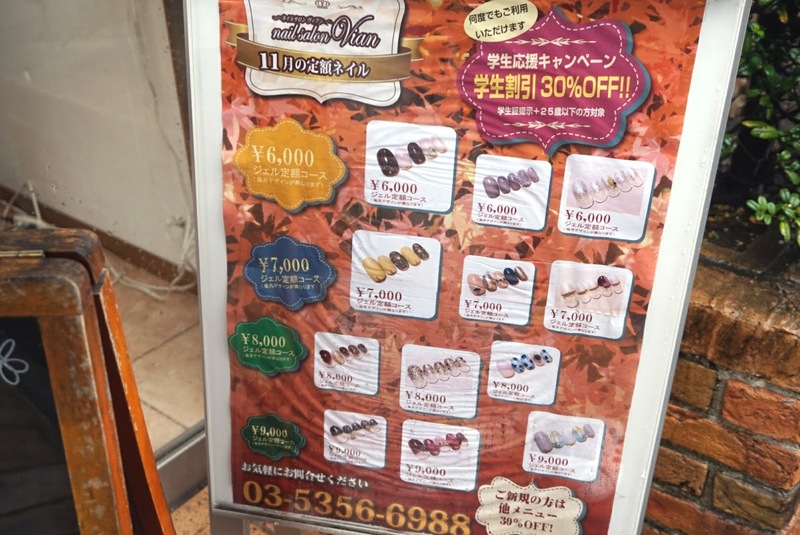 Warning in advance: Japanese nail salons are more expensive than typical nail salons in America. 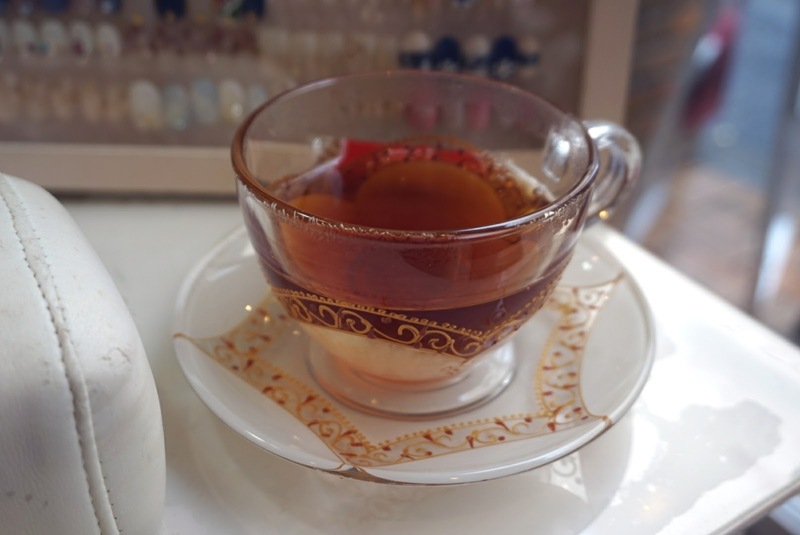 Japanese nail salons typically do gel polish (ジェルネイル), acrylics (アクリックネイル) can be done but always require a reservation as they take a significant amount of time. 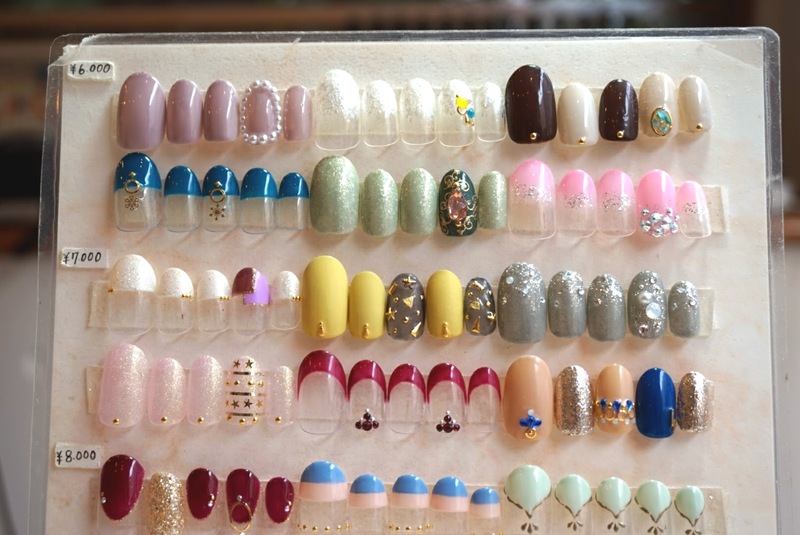 For a gel nail polish with no frills, you'll be charged about 5000 yen in Shinjuku ($50). This is where the themed designs come in to get the bang for your book. 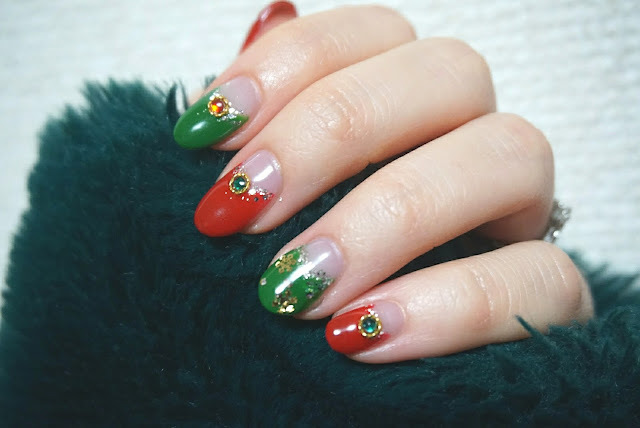 Holiday nail set designs range from 5000 to 9000 yen, and they are often very pretty and have lots of design options. 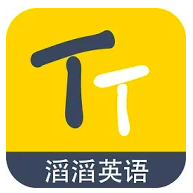 To make a reservation, you can simply text their LINE account or call them on the phone (When I call on the phone I typically start with "予約したいんですが〜 yoyaku shitain desu ga" which means 'I'd like to make a reservation') . 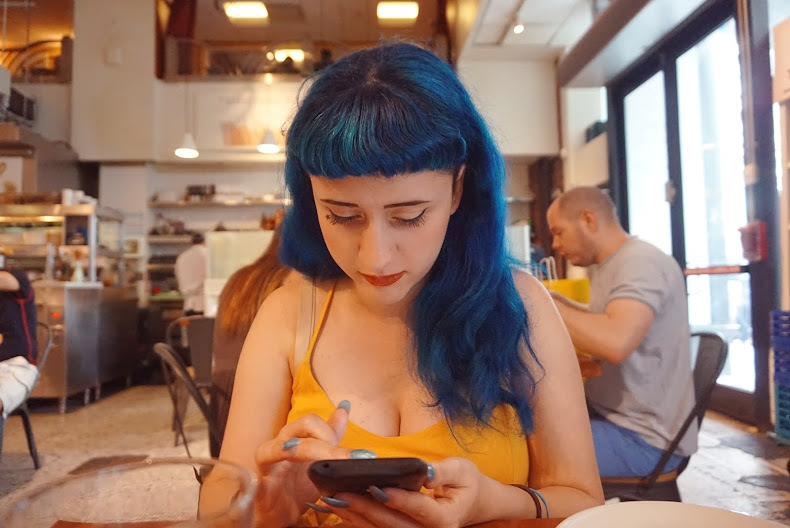 Since there are only a few workers and the salon is very small, making a reservation might be a good idea to make sure you can be served on time. However, if you come during the early morning on a work day, it's likely you'll be able to be seen quickly! I made a reservation beforehand and came to the salon about 15 minutes before my scheduled time. Like I said before, the salon is really tiny! There are only two staff members, and one of them is the owner. I got my nails done by the owner this time! 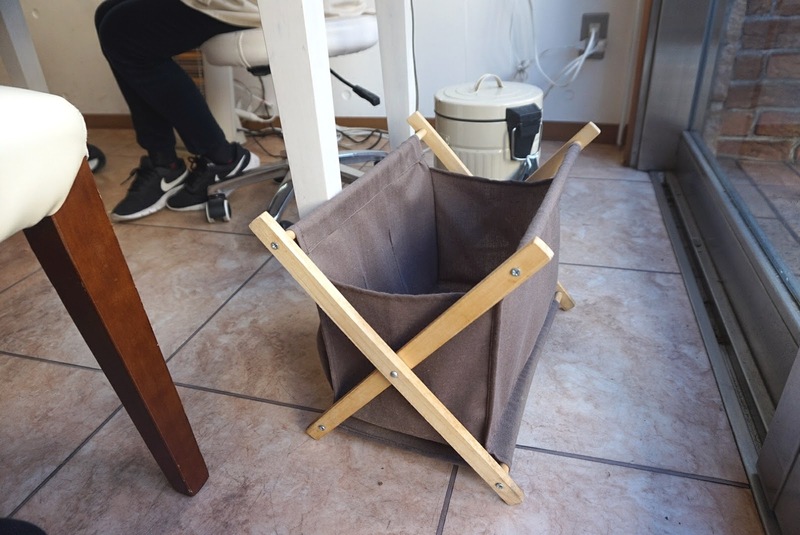 I sat down at the table and put my bag into the little container they have to the side of the workspace area. I think this little bag/box thing is really cute and handy! When you first sit down you're usually handed a board similar to this! This has all their discounted nail design sets (excluding the ones on the board outside). As you can see, there are a lot of cute designs to choose from, and this is only one of the many boards they had! The cheapest design set was 6,000 yen, and while I thought the designs were cute, none of them really screamed 'Christmas' to me. These sets can often be tweaked a bit to fit the customers preferences for little or no charge. For example: I could change the polish color to a red instead of a pink, and most likely not incur any kind of fee. However, if you wanted to add a larger gem to replace a smaller one, the salon may charge you a small fee for it. It's important that when you pick out your nail designs, especially if you're customizing it in any way, that you ask how much it costs. 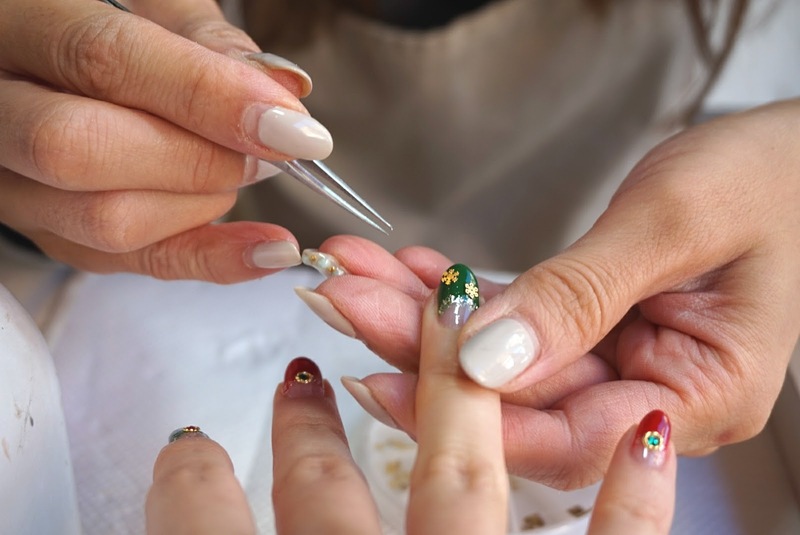 If it's your first time in a Japanese nail salon the price can be a bit overwhelming, so don't be afraid to ask questions about the prices of certain designs. You can simply say "このデザインはいくらですか？ kono dezain wa ikura desu ka? A typical rule of thumb is that the more complex the design, the more expensive. This salon offered a complimentary tea and biscuit (biscuit not pictured because I ate it in a flash). You're usually given this while you're deciding on what design you'd like. 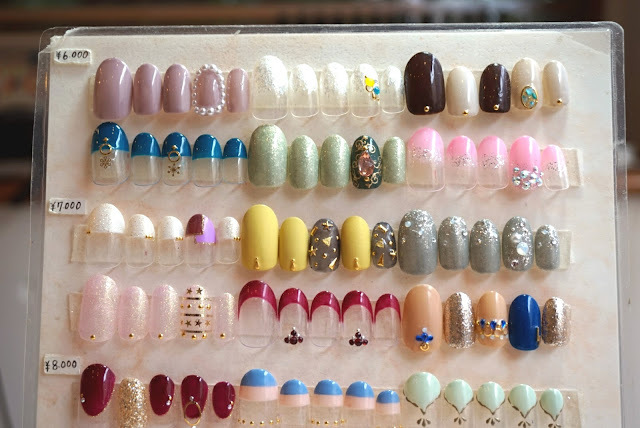 If you're not sure what design you'd like, I recommend asking your nail technician what design they recommend! You can say オススメは何ですか？ osusume wa nan desu ka? You can give a general idea of what colors you like and they can pick out some design sets you may be interested in. To start things off, my previous gel polish was removed, and the nail care began! The nail technician asked me how long I'd like my nails (どのぐらいですか？dono gurai desu ka), and I told her I liked the length (長さ nagasa) and wanted to keep it that way. As for the shape (形 katachi), I tend to stick with the rounded style (ラウンドスタイル raundo sutairu). I picked a design from another board that had a very 'Christmas' feel to it, and so she kept that board to the side as a reference for when she started the design. An interesting fact about Japanese gel nail polish is that, unlike American gel which comes in a normal polish bottle, Japanese nail salons prefer a slime-like, thick paste gel mixture. 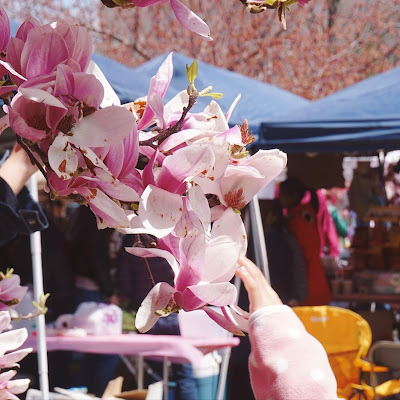 It comes in a circular container and they usually mix it with a small mixing tool until it becomes pliable, and then they apply it with a small brush. I think this type of gel may be a key reason as to why Japanese gel is so resilient and lasts so long! 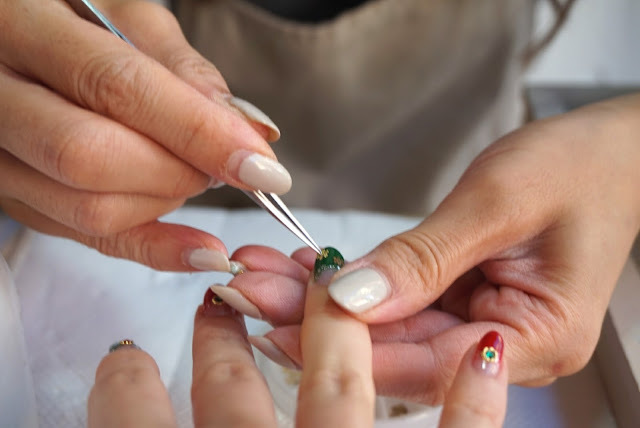 Not only that, but the nail technician puts a painstaking amount of care into how many layers of gel is applied, and the evenness of each nail. I've found that the attention for detail consistently gives me flawless and long lasting nails. This is the only time I saw her use a traditional looking nail polish bottle. The top coat for the designs was also gel, but it came in this package rather than the thick, goopy application that would come from the circular container and brush. I would say this entire process took about an hour, and it was really enjoyable! After the technician makes sure your nails are dry, she applies a rosewater solution (pictured in the background in the pink capped bottle), along with some coconut cream hand lotion. Finally, all this is wiped off gently using a hot towel, and you're good to go home! 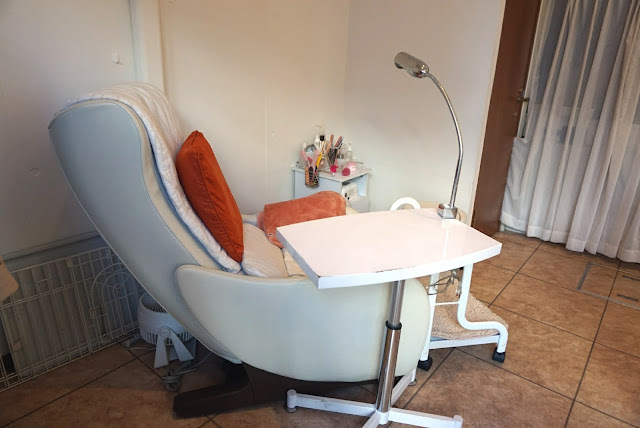 This salon also offers gel pedicures, and have several boards of toenail polish design sets! Since I custom designed this nail design set with the technician it ended up being more expensive than what I usually pay. Last month I payed about 6400 yen for my nails, but this month it was around 9000 yen! Pricey, I know! However, I really feel like you get your money's worth when it comes to the durability, quality and beauty of these nails! Not only that, but I feel my natural nail has become stronger! 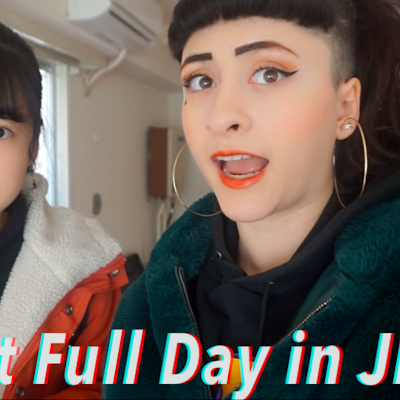 While I can't say for sure every single nail salon in Tokyo does nails in this exact fashion, this is the general idea of how a typical nail salon visit would go! This looks like a really nice experience. I have done gel manicure in the past but I don't like it because it really damages my nails when it is taken off. However, I do sometimes go for a normal manicure and to enjoy the whole experience, not in Tokyo though, as I live at the other side of the world. 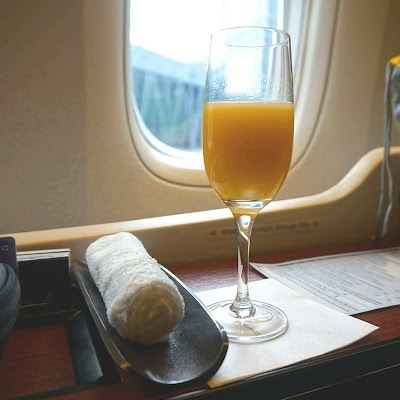 This post was beautifully written I'm not even in Japan or going anytime soon, but I fell in love with the nail art here and all the deets you provided. How cute is this nail shop!? It looks so much better than the Korean ones!